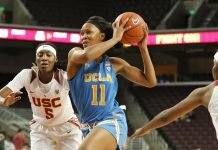 Kristine Anigwe scored 20 points for No. 21 Cal before fouling out in the fourth quarter against USC. Photo by KLC Photos. Los Angeles – With an identical 13-5 record heading into their matchup Sunday, both Cal and USC were looking to avenge tough losses from Friday night. However, both teams quickly found out that they were much closer than anticipated in Cal’s 62-59 win over the Trojans. 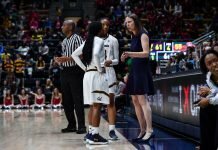 “The Pac-12 is really tough and then when you put Cal letters on a jersey and USC letters on a jersey it gets even tougher,” Cal coach Lindsay Gottlieb said. 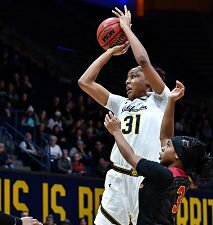 The Golden Bears saw four finish in double figures Sunday, including Kristine Anigwe, whose 20 points came in only 20 minutes of play, as she fouled out with five minutes remaining in the fourth quarter. Mikayla Cowling added 12 points and Kianna Smith and Asha Thomas each notched 10. Neither team was able to distance themselves from the other in the 14-lead-change matchup that also featured 16 ties. With two minutes remaining in the fourth quarter, the Trojans found themselves with a modest one-point lead following a layup by Kristen Simon. Thomas then answered on the very next Cal possession, driving to the basket and fouled by Minyon Moore for the three-point play. The final minute of play saw USC attempt six shots from behind the arc, but all six fell short. Gottlieb said the win was hard-fought, and it showed growth. Simon led the Trojans with 21 points, while Moore added 19 and Aliyah Mazyck, 13. USC suffered a close loss Friday to Stanford, who rallied from behind to capture the win. With their two straight losses, the Trojans now find themselves at 3-5 in the conference to go along a now 13-6 overall record. Coach Mark Trakh said the squad is showing progress. Trakh noted improvement in late-game offense from Friday. Simon, Moore and Mazcyk each played 40 minutes. Moore said players believe in putting the team first. Up next for Cal will be a home series against Arizona and Arizona State, while USC will visit Washington State and Washington.